2018. January 30. Bermuda’s population dropped by 458 over four years to 63,779, the 2016 Census figures reveal. The statistics in the preliminary report released yesterday also recorded a surge in the number of homeless people — up from 82 in 2010 to 138, a 68 per cent rise. The report also showed a significant drop in residents in both Hamilton and St George’s. The population of St George’s fell over the four-year period from 1,801 in 2010 to 1,298 in 2016, a 28 per cent drop. Hamilton recorded a decline of 17 per cent, from 1,032 people in 2010 to 854 people in 2016. The number of non-Bermudian residents went up by just 62 over the four years to 2016, from 13,516 to 13,578. The number of permanent resident’s certificate holders fell by only two, down from 1,881 to 1,879. There was a slight increase in the number of non-Bermudian spouses of Bermudians, up from 2,112 to 2,186. The number of emigrants counted increased, while immigration declined, but data was incomplete for both the 2010 and 2016 Census. The report explained both counts had been “unable to capture situations where entire households left the island, as there was no one to provide this information”. Other notable figures included an increase in the ratio of men to women from 92 to 93 males per 100 females. The median age climbed from 41 in 2010 to 44 in 2016. Academic qualifications went up by several percentage points for high school certificates, vocational certifications and associate’s degrees and degrees. At the same time, the figures for residents with no formal educational certificates fell from 11,815 in 2010 to 7,296 in 2016. Unemployment remained steady at 7 per cent. The number of dwelling units increased to 28,192, up from 26,923 in 2010, and the average household size declined, from 2.39 to 2.26 people per household. The report, compiled by the Department of Statistics, is available at gov.bm/bermuda-census. 2014. December 31. Bermuda's resident population in its 20.75 square miles of total land area was 65,180 according to the World Bank. This averages 3,141 people per square mile. 2012. For December 17. Date of a Bermuda' General Election. Of the oldest citizens, those over 100 years old, 19 were registered to vote according to figures provided by the Parliamentary Registrar. Another 427 registered voters were in the 90 to 99 age group, 2,148 between the ages of 80 and 89, while 4,233 70 to 79 year olds were registered to vote. Fifteen percent of the registered voters (6,651) were between the ages of 18 and 29, while those aged between 50 and 59 represented the highest proportion (21 percent) of registered voters by age — or 9,024 voters. Those between the ages of 40 and 49 come next at 18.6 percent or 8,143 voters. 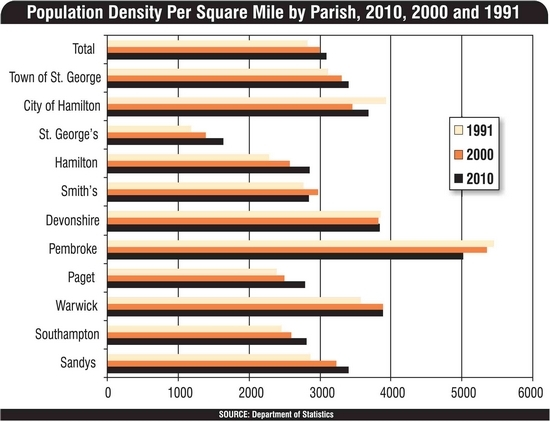 Broken down by parishes, St George’s (18 percent), Paget (12 percent) and Hamilton (11 percent) were reported to have the highest population growth since 2000. Just two parishes, Smith's and Pembroke, which recorded declines of five and six percent respectively showed negative growth. Pembroke and Warwick maintained their positions as the most populous parishes with 10,602 and 8,606 persons respectively. The City of Hamilton increased its residential population by six percent from 969 persons during the preceding Census, to 1,030. The change reflects condominium developments in the City during the intervening period, according to the Statistics Department. The Town of St. George also saw a population increase of three percent from 1,752 persons to 1,802 in 2010. Bermuda today is the third most densely populated place on earth, based on the figures above. In terms of population per square miles, this is only exceeded by Monaco with 15,921 and Singapore with 6,891 persons. After Bermuda comes Vatican City with 2,200 per square mile; Malta, with 1,229; Puerto Rico, with 1112 (yet often written about in USA, including by the National Geographic, as one of the most densely populated places in the world); Bahrain, with 1,042; Maldives, with 1,036; Bangladesh, 962; Taiwan, with 699; Mauritius, with 647; and Barbados, with 642. In contrast, note the very low populations per square mile of the United States of America - from where over 85% of its visitors come; then Canada; United Kingdom (632); Japan (870); Netherlands (1002). Bermuda is also the fifth smallest country in the world at only 21 square miles in total, after Vatican City, Monaco, Nauru and Tuvalu; and is one of the most isolated. The least densely populated area of mainland Bermuda is Tucker's Town in St. George's Parish, an exclusive area for the very wealthy that denies access to all locals and visitors who are not members of the Mid Ocean Club. Unlike most other places with a native population dating back to the mists of time, Bermuda had no resident permanent population at all until 1609 when English settlers came by accident, then came deliberately from 1612. Only a few stranded mariners were here earlier, involuntarily and briefly. Bermuda was too tiny (only 21 square miles in total area), had no natural resources, no gold or silver or anything else that could be mined or refined. It remained without a permanent population long after the Spanish, Portuguese and Dutch East Indies empires were established, the French founded French Canada and the British founded Jamestown. See History. Nowadays, Bermuda is both a tourism resort and offshore business center. In its ratio of legislators per square mile, far more than any other country in the world in the ratio of legislators to voters. For example, in the European Union, there are 736 Members of the European Parliament (MEPs) for 350 million voters throughout the EU, equivalent to 1 MEP for every 470,000 voters; in the United Kingdom 647 MPs for 40 million voters, equivalent to 1 MP for every 64,000 voters; but in Bermuda 36 MPs for 33,500 voters or 1 MP for every 1097 voters in its 21 square miles. Other examples include St. Lucia, with 14 parliamentarians in its 240 square miles; Barbados, also in the Caribbean, with 28 elected members in its parliament and 12 senators, in its 166 square miles and with a population of 266,000. A very high rate of AIDS and HIV. However, Bermuda reports these accurately and it is believed some other countries do not. Highest number of telephone lines, computers online and televisions per population. The highest in Gross Domestic Product (GDP) in the World, according to the World Bank, but also one of the highest in cost of living. The least generous benefits and services to its senior citizens and the disabled of any of the countries with a high GDP. There is a current population growth rate of 1.5% per annum. The birth rate is 15 births per 1,000 population and the total fertility rate is 1.7 children born per woman. The death rate is 7 deaths per 1,000 population, the net migration rate is 7 migrants per 1,000 population, and the infant mortality rate is 3.6 deaths per 1,000 live births. Life expectancy at birth is 72 years for males and 78 years for females. Most - about 78% - of residents were born in Bermuda of Bermudian parents or a Bermudian parent and are therefore Bermudian. For decades now, it has not been sufficient for persons born in Bermuda to be regarded as Bermudian, even if born here, unless one parent is also Bermudian. The majority of the permanent residents are described first, followed by the minorities. More than 68 percent of Bermudians are black, of African heritage, Afro-Bermudians. The first came here in about 1616, appreciably after the first white colonists. Some descend from slaves imported by British settlers, not directly from Africa but from Africa via the Caribbean more than 900 miles to the south. Some American Indians were also brought to Bermuda in the 17th and 18th centuries, as slaves or prisoners-of-war. Black slavery (like white slavery or serfdom much earlier) was effectively abolished in Britain since the early 1800s. Slavers and slave ships were relentlessly hunted down in the Atlantic and Caribbean by Royal Navy warships. Slavery was formally abolished in Britain much earlier and in Bermuda in 1834. From the 1880s to the early 1900s, many Afro-West Indians arrived voluntarily from many islands of the Caribbean 900 or more miles to the south and settled. Many Bermudians have forebears who came originally from them. There are also Bermudians and non-Bermudians here, originally or currently from the following islands. In July 2003, Bermuda formally joined the Caribbean Community, as an Associate Member (non-voting member), in certain areas but not in others. This specifically excludes the free movement of Caribbean nationals to Bermuda and any prospect of Bermuda joining CARIFTA or its newest free trade organization - the Free Trade Area of the Americas (FTAA) - and its hopes. Membership of the Caribbean Community will cost Bermuda about US$90,000 a year. Direct trade between Bermuda and Caribbean countries is also welcomed and encouraged, especially given the close or extended family links many Bermudians have with Caribbean islands or territories. Because of this, there is a Monday-Friday 10 am and 5:45 pm 5-minute Caribbean news feature on local radio (VSB) produced by the BBC of England and a lively Caribbean-produced feature on certain evenings. But the irony is that there are no scheduled air or sea services at all between Bermuda and the Caribbean, as there were in the 1930s, 1940s, 1950s and 1960s. Only Japanese car carriers - no regular freighters - call at both Bermuda's City of Hamilton and some Caribbean ports. It is hoped they will resume. Many visitors to Bermuda from the USA and Canada assume - wrongly - that there are air services connecting Bermuda with the Caribbean nearly 1,000 miles to the south. Presently, virtually all imports to Bermuda made in the Caribbean come via the USA or Canada. All visitors to Bermuda who are nationals of and resident in Caribbean islands must come via the USA or Canada or United Kingdom and must have appropriate visas to come via those countries. Effective January 2003, all Jamaican nationals who are not Bermudian must also have a visa to enter Bermuda on business or vacation. The second-largest (about 33 percent) ethnic group of Bermudians are Caucasians - white. They were the first to arrive as colonists by an appreciable time and for years outnumbered Afro-Bermudians. Many are of European extraction, descend from original British colonists who emigrated here voluntarily and can often trace their roots back to England, Scotland, Wales and Northern Ireland. More were imported, either as free people or as indentured laborers for a period until they earned their freedom. Relatively few came in one of these two ways originally from Ireland, France or other European countries. They were joined by one-time Portuguese laborers brought in initially from the Madeira Islands as agricultural labor when slavery was abolished in the 1830's, then from the Azores. More recent arrivals have come, in order of numbers, from Canada, the United Kingdom (Scotland, Wales, Northern Ireland again and Channel Islands as they too use British passports) and the United States of America. But as Bermuda is an international business center, many collectively have also come from Europe, Asia, Russia, Turkey and more. Bermuda also hosts people from Ghana, Japan, Nigeria, Pakistan, Sri Lanka and more. In those who are not Bermudian - not by preference but by law, despite having been here for many years and would easily qualify by residence as citizens in all other Western Hemisphere countries - Canadians are the most prevalent in the international industry of accounting and auditing, banking, Bermuda Government, commerce and education, the largest single group of guest workers. Britons are next. Many Americans are here, some as spouses of Bermudians. A number of Asians work in the hotels and restaurants. Some from the Philippines are in domestic service or the restaurant industry or are registered nurses. Those born in other countries, or in Bermuda but without a Bermudian parent and are also not Bermudian, may have access to a Bermuda-based Consulate from or representing their country. A number of these are in Bermuda, serving both their incoming or resident nationals and visitors going to such countries from Bermuda. American Ladies in Bermuda (ALIB). Despite its name, it provides information, support and fund-raising activities for new residents of all nationalities. Meets third Sunday each month at Royal Bermuda Yacht Club, 2-4 pm. Registered charity 103. American Society of Bermuda. Since 1961. Phone: 441/291-3543 (PO Box HM3339, Hamilton HM PX, Bermuda). Membership fee. Association of Canadians in Bermuda. P. O. Box HM 2071, Hamilton HM HX. A non-profit organization for Canadians in Bermuda, to help keep the Canadian culture alive. Founded in 2000. Registered charity 566. Association of Filipinos in Bermuda. There are about 600, including doctors, accountants, nurses, waiters including domestic servants and more. Bermuda Registered charity 529. Barbados Association of Bermuda. An organization of Barbadians living and working in Bermuda. Includes an annual show of Bajan dishes cooked by men. About 300 Bajans work in Bermuda, including teachers, Police, chefs, lawyers, judiciary. Registered charity 401. Bermuda Branch of the British Conservative Party. Contact Neil Hitchcock, The Glebe House, 17 Glebe Hill, Tucker's Town, HS 02, Bermuda. Bermuda Irish Association. There are about 500 Irish residents of Bermuda. They hold an annual formal dinner and celebrate other events before, during and after St. Patrick's Day every March. Bermuda Newcomers Inter-varsity Club. Phone 292-9018. Caledonian Society of Bermuda. Since 1936. Celebrating all things Scottish on The Rock, the Caledonian Society of Bermuda are known for their ceilidhs, St. Andrew's Balls, New Year/Hogmanay Balls, Burns Suppers and more of the best events on the island. Circulo Hispanico. Informal bi-weekly gathering of people in Spanish/Central or South American/language and culture. Beginners to native speakers. Alternate Thursdays 6 pm at Wesley Methodist Church Hall, Church Street, Hamilton. Phone 295-7506 by day or 238-0724 evenings. Club de la Boule Gourmande. Petanque or boule every second Sunday of the month, 1-3 pm. Bermuda College. Emerald Isle Society. Meets third Friday of each month. Phone 292-6889 evenings. Primarily for Irish nationals resident in Bermuda. Always celebrates St. Patrick's Day with a fine, black-tie 5-course dinner, with everything in green, white and gold and an Irish entertainer flown in. 2017. April 10. Irish citizens in Bermuda can now avail themselves of online passport applications, according to John Kane, the Irish Consul. Current passport holders over 18 can reach the service with mobile phones, computers and tablets via the Department of Foreign Affairs at dfa.ie/passportonline. The applicant’s name must be the same as on their previous Irish passport, which must have expired less than five years ago, with passport numbers beginning with the letter P or L. First-time applicants and children must continue with the present application system using a form. Mr Kane said the new system would deliver a quicker turnaround and allow credit cards to be used. Standard passports cost €80 euros; larger passports cost €100 euros. The new standardization of children’s passports sees the extension of the five-year passport to children aged 17 and younger. The three-year infant passport is no longer available, and all children’s passports now cost €30. Applicants are “strongly advised” to apply at least six weeks before their intended date of travel. English Speaking Union. The Cedars, Cedar Avenue, Hamilton HM 10. Telephone 292-7684. Not a union at all but a cultural organization established in England in 1918 to promote understanding and friendship. The Bermuda branch was established in 1922 and held its first meeting at the long-gone Hamilton Hotel. It has about 165 members. Filipino Association. In May 2015, a Philippine Embassy team from Washington DC visited the Island for this year’s consular and labour outreach. Connecting with the Filipino Association, it fulfilled a number of official duties including the renewal of more than 200 passports, 12 birth reports, eight marriage reports and three oaths of dual citizenship, while more than 300 absentee voters were registered by the team for next year’s Philippine national elections. Authentication of documents were held by the consular team headed by consul Arlene Magno at The Fairmont Hamilton Princess on May 23 and 24. The Philippines Overseas Workers Welfare Administration also renewed memberships for Filipino contract workers on the Island. On May 22, the labour team, led by labour attaché Angel Borja Jr, paid a courtesy call to Premier Michael Dunkley, who was accompanied by Cabinet secretary Derrick Binns at the Cabinet Office. 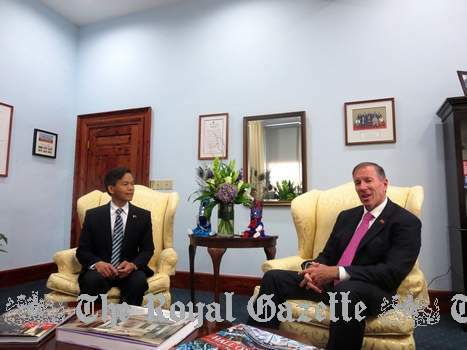 The Premier welcomed the group composed of Mr Borja, labour officer Oliver Flores, Rowena Comber and Sonia Loudermilk of the Filipino Association and acknowledged the contribution of Filipino workers to Bermuda’s economy. Mr Borja and the team visited the Department of Workforce Development and met with George Outerbridge, Oonagh Vaucrosson and Lauren Smith to address employment concerns of Filipino workers on the Island. Then the team visited a few business establishments employing Filipino workers. On May 23, an open forum was held with the Filipino community at The Fairmont Hamilton Princess hotel and was attended by Ms Vaucrosson and Mr Smith from the Department of Workforce Development The consul and labour attaché said the Bermuda outreach was a success as they aim to strengthen relations between the Bermuda and Philippine governments. German Association. For German nationals resident in Bermuda. Indonesian Community in Bermuda. A small but very caring group that in 2016 helped Indonesian sailors stranded in Bermuda. Jamaican Association (Bermuda). An organization of Jamaicans living and working in Bermuda. L'Alliance Francaise des Bermudes. The organization for French nationals and French-speaking locals. See Bermuda's Links with France. Every July 14, it celebrates Bastille Day. RC 537 2018. August 6. Four Bermudian students spent most of last month immersed in French language and culture, thanks to the L’Alliance Française des Bermudes. The 3½-week programme, supported by the Christian Humann Foundation, sent teenagers Ywione Darrell, J.P. Didyk, Maya Leighton and Daria Symonds to Biarritz on the Basque coast of France. The four, from Saltus Grammar School, Somersfield Academy, Mount Saint Agnes and the Berkeley Institute respectively, were winners of the 2018 Alliance Française des Bermudes’ annual student competition. New Islanders group. Monthly get-togethers for new female residents. A way to meet new women and participate in sporting activities. Affiliated with the International American Women's Club but not confined to Americans. Portuguese Community. Large group, many in Bermuda are Portuguese or of that extraction. The community comes together yearly in May to celebrate the annual Festa do Senhor Santo Cristo dos Milagres. The celebration, whose title translates to “Festival of the Christ of Miracles”, originated centuries ago on the island of São Miguel in the Azores and was brought by the Azorean community to Bermuda, as well as areas of the United States and Canada. Celebrations begin with a church service and a parade through Hamilton carrying a statue of Jesus adorned with red and white flowers. Hundreds of revelers later move to the Bermuda Athletics Association car park where the festive atmosphere continues with live music and traditional Portuguese including bifana and sweet malassadas. Portuguese groups in Bermuda include the Portuguese Pastoral Council of the Catholic Diocese, Portuguese Cultural Association, Santo Cristo Committee and Vasco da Gama Club. Sri Lankan Community. There is a sizeable one (many accountants, chefs and at least one lawyer). After the 26 December 2004 Tsunami disaster that affected Sri Lanka very badly, they and their Bermudian sympathizers formed a registered Bermuda charity "Bermuda Help Sri Lanka Relief Fund". It has collected over $80,000 for housing relief in Sri Lanka. West Indian Association (Bermuda). An association for nationals of the Caribbean living and working in Bermuda. The West Indian community here has made significant contributions to the development of the Island in every sphere, in art, education, food, health, law, politics, trade unionism and much more. In November 2014 there were 42,987 registered voters, about 59 percent of Bermuda's total current population. As soon as local citizens become at least 18 years old they can register to vote.